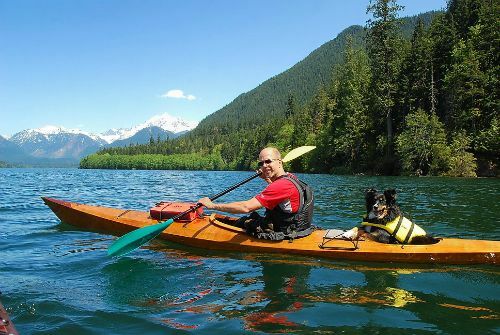 "Riva and I had a great day on Baker Lake, Washington in my Arctic Tern 17." A whole family in the Triple! Al says, "Tipper fits in the Pinguino perfect. He really enjoys kayaking." Freya used to love riding with Lucy in the Osprey Triple's center cockpit. 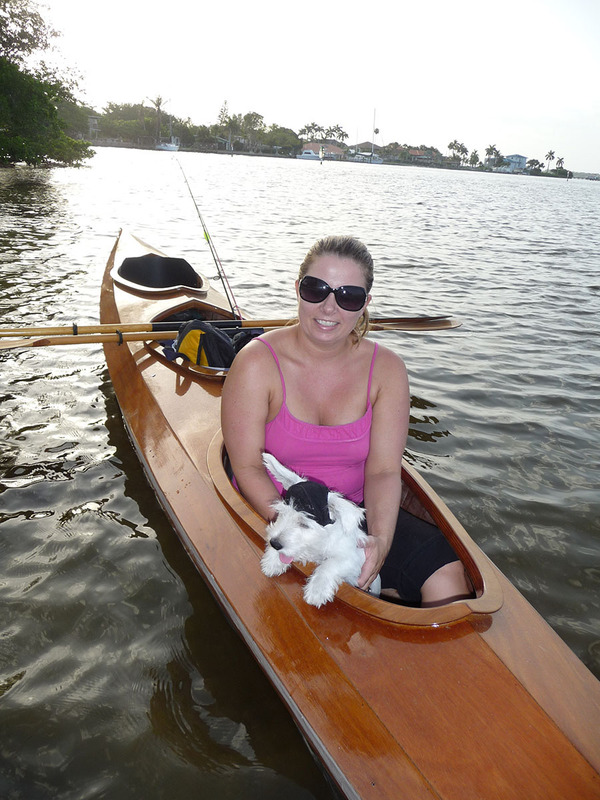 We often get calls about which boats are “dog-friendly”. 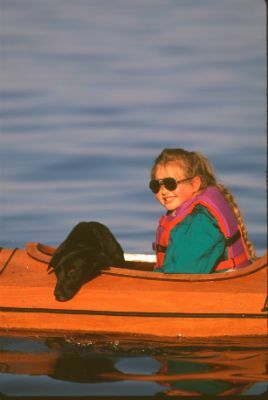 Of course, it depends on the size of dog and the dog’s willingness to participate, but plenty of people manage to bring their best friends on the water with them. For smaller dogs that like to ride in their owner’s laps, the larger cockpit on the Pinguino 145 can accommodate furry companions nicely. For larger dogs, it’s probably best to go with the Osprey Triple (see video below), which has a third, center cockpit for children or dogs (or both! 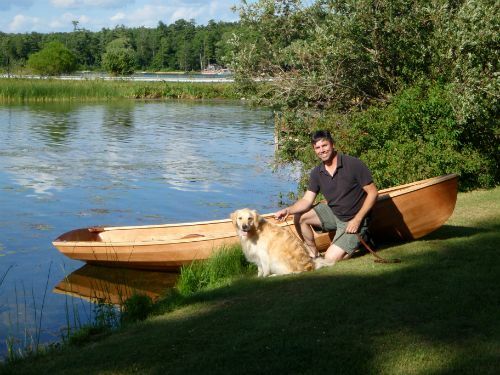 see pics above) or the Wherry, or Taiga Canoe. While our customers have come up with some pretty clever ways to outfit their kayaks (again see pics above), bear in mind that hatches do serve as flotation in a kayak so having a dog ride in a hatch would be best if the dog sits in something, like a sea sock, to minimize the amount of water that would have to be pumped should the kayak flip. I thought I’d share my story about building my first boat. 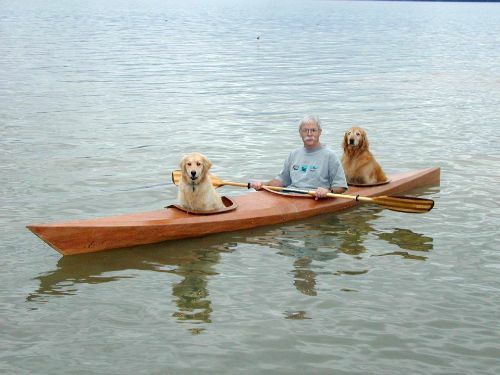 It bothered me to leave a sad dog at home while George and I went out having fun, so, the only thing to do was to build an Osprey Triple so my Golden Retreiver, Lucy could come paddling also. Hence the name, “Lucy Too”. At 5’2” and 112lbs, a wooden boat was the only triple I could help carry. 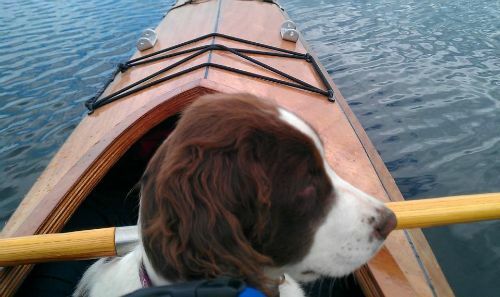 The Pygmy Osprey has been a great kayak for the three of us. Thanks for a great boat! Here are some pictures of the Pinguino in the water up in the mountains. The Pinguino and Arctic Tern 17 are great boats. As you can see Tipper fits in the Pinguino perfect (see pics above). He really enjoys kayaking. The larger Cockpit makes it possible for him to go with me. P.S. The Pinguino is super fun and very stable. Winston loves the wherry and that was his first time ON the water (see pic above). I think it is in his genes. 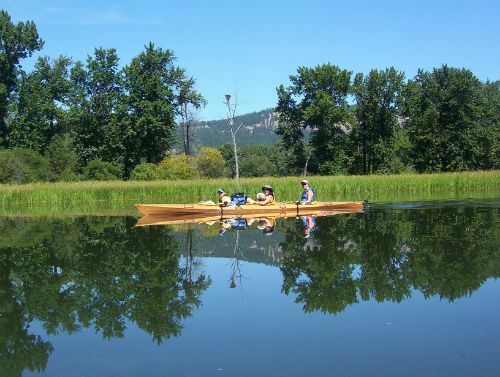 His predecessor, Mickey, did the Alagash River, around Acadia Nat’l Park out to Isle Royale Nat’l Park in Lake Superior, Voyaguers Nat’l Park, The Upper Missouri, parts of the Gunnison, Green Arkansas, Blue and Colorado Rivers and too many lakes to mention in that old wherry. It’s a very dog friendly wherry. 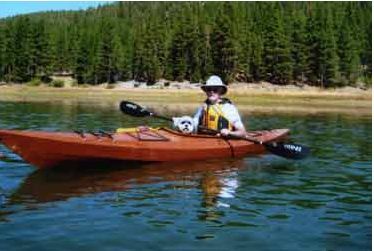 The Osprey Triple is a great boat for it’s size. It is great for trips for one or two people. 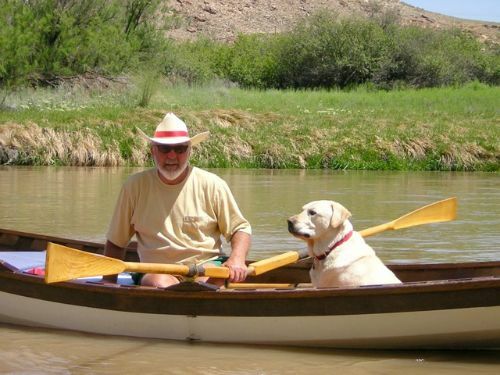 I usually paddle the boat with our yellow lab and gear for a weekend. 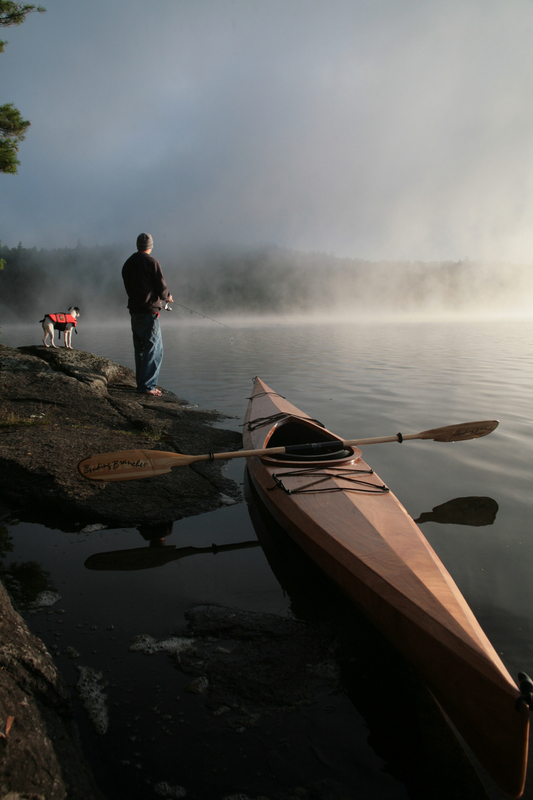 I have no problem paddling the boat solo and keeping up with the solo kayaks I paddle with.